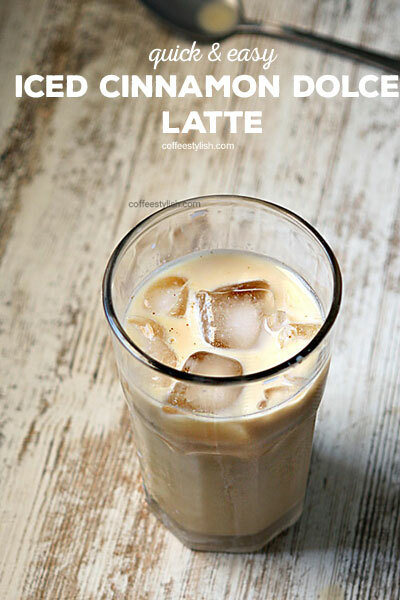 Quick and easy method for making Iced Cinnamon Dolce lattes at home. 1. 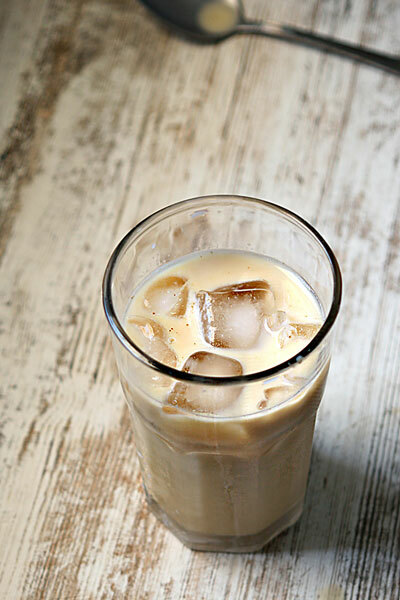 Okay so first, put 4 ice cubes in a tall glass or your favorite tumbler and s l o w l y pour in 4 ounces double strong coffee. I use Japanese instant pour over method so I brew coffee directly over ice, but any other brewing method should work just as well. If you have a Keurig make 1 k-cup at 4 ounce setting, or brew 2 tbsp coffee with only 4 ounces water (not 8 ounces) in a French press or a standard drip machine, then slowly pour over ice cubes. Cold brew coffee concentrate will work too. 2. Next comes a Cinnamon Dolce syrup. Add 2 tablespoons. Use a store bought ready-made syrup or easily make one at home: mix 1 cup water, 1/2 cup white sugar + 1/2 cup brown sugar and 1 tbsp ground cinnamon in a pan and simmer for 10 minutes. Remove, add few drops of vanilla extract, stir and allow to cool. You can store this syrup in refrigerator for up to 10 days. 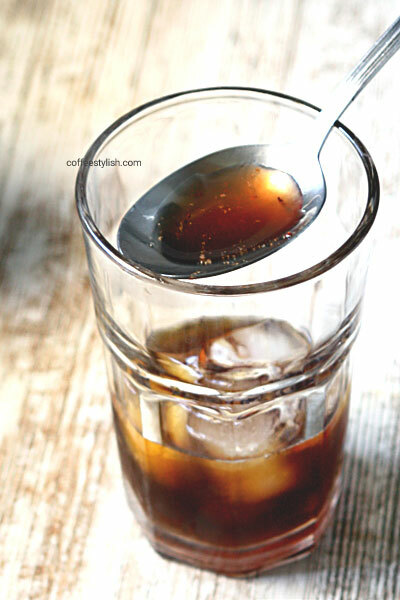 Put 4 ice cubes in a tall glass and s l o w l y pour in 4 ounces double strong coffee or coffee concentrate. but any other brewing method should work just as well. If you have a Keurig make 1 k-cup at 4 ounce setting, or brew 2 tbsp coffee with only 4 ounces water (not 8 ounces) in a French press or a standard drip machine, then slowly pour over ice cubes. We want the ice to locks all the coffee flavors and that’s why we need to pour in the coffee really slowly. Then, add 2 tablespoons Cinnamon Dolce syrup and 4 ounces cold milk and stir. Dairy free: replace milk with coconut, almond or soy milk. I hope you get to try this iced cinnamon dolce latte at some point this summer, it’s sooo delicious. Oooh what a good recipe, and so quick and easy too! That’s a very clever idea to add cinnamon dolce syrup, gives it a sweet kick. 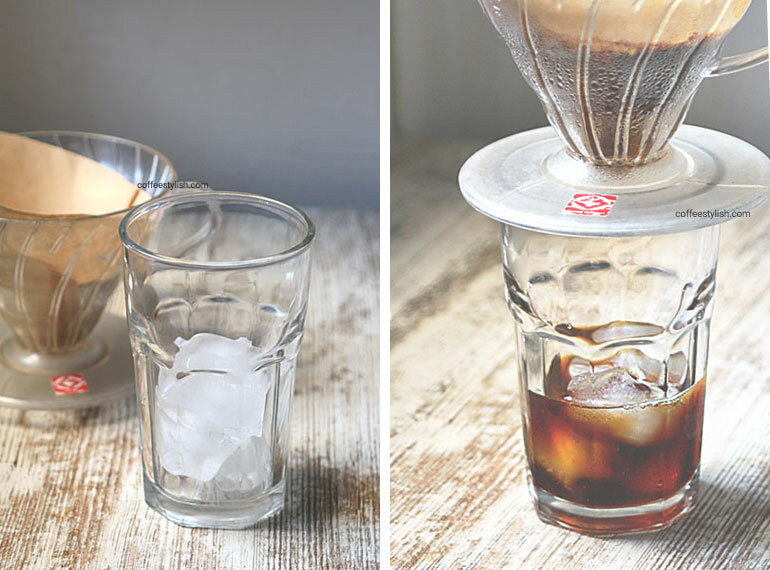 Definitely looks like a good way to spice up your iceed coffee for those warm summer mornings.